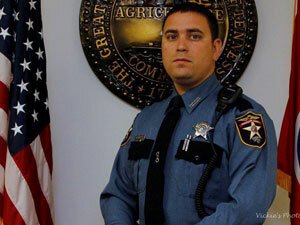 Deputy Keith Bellar succumbed to a gunshot wound sustained the previous day when he stopped to help at what he believed to be a car accident in Dickson. A Dickson 911 dispatcher had just completed her shift when her estranged husband began following her. As the vehicles traveled on West Walnut Street the husband ran the wife off the road near McKenzie Street. Deputy Bellar witnessed the crash but was not aware it involved a domestic dispute. When he stopped at the scene the husband immediately opened fire on him, striking him in the head before he was able to exit his patrol car. The man then committed suicide. Deputy Bellar was flown to Vanderbilt University Medical Center where he succumbed to his wound the next day. Deputy Bellar had served with the Dickson County Sheriff's Office for six years. He is survived by his wife and 6-month-old son. Keith is still missed so very much. He was a kind and caring young man. My heart aches for his family, I can't imagine their sorrow. God bless and keep all who serve as Keith did. God bless their families with courage and peace.